Violence flared in eastern Syria where the US-led coalition said it killed pro-regime fighters to fend off an attack on its Kurdish allies. 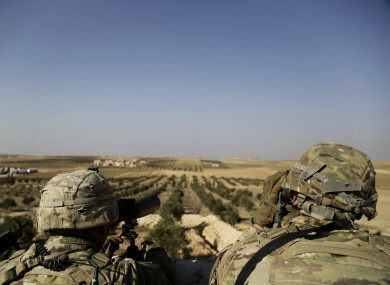 American troops look out toward the border with Turkey from a small outpost. BRITISH MEN BELIEVED to be members of the so-called Islamic State were captured today by Kurdish fighters in Syria, it’s been reported. The two men formed part of a four-man “execution cell” of the terrorist organisation, and had dubbed itself “the Beatles” because of their British accents, according to the New York Times and the BBC. All four men had lived in west London, and the men’s ages are understood to have ranged from their 20s to 30s. They’re the last two members of the group to be captured; the group are understood to have been responsible for the murder and torture of dozens of hostages in Syria. US officials said that the infamous Jihadi John was the ringleader of the group at one point, until he and the fourth member of the group were killed in 2015. Syrian regime jets pounded Eastern Ghouta today, sending the death toll for the four-day assault on the rebel enclave on the outskirts of Damascus soaring past 220. Violence also flared in eastern Syria, where the US-led coalition said it killed at least 100 pro-regime fighters to fend off an attack on its Kurdish allies. The clash marked a fresh escalation between Washington, which has threatened the regime over its alleged use of chemical weapons, and Damascus, which labelled the latest incident in eastern Syria a “war crime”. The United States threw its support behind a United Nations plea for a ceasefire in Eastern Ghouta. “These attacks must end now,” State Department spokeswoman Heather Nauert said. In Eastern Ghouta, which lies east of the capital and has been besieged since 2013, residents had no time to mourn their dead or treat their wounded from the previous day’s bombardment. “These are the worst four days that Eastern Ghouta has ever gone through,” said Hamza, an overwhelmed doctor at the Erbin clinic who was treating wounded patients. From 2011 until now, there has never been the level of bombardment we’ve seen in the last 96 hours. The death toll mounted steadily throughout today, with the Syrian Observatory for Human Rights giving 75 civilians dead by the evening. Three died of wounds suffered on Wednesday. That brought to 228 the number of civilians killed since the regime launched a campaign Monday of heavy air raids on the area, which has an estimated 400,000 residents. Among them were at least 58 children, the Observatory said. “Children and teachers are terrified that at any moment they could be hit. The siege means there is nowhere for them to escape,” said Sonia Khush, Save the Children’s Syria response director. There must be an immediate halt to the fighting and an end to the siege. Moayad al-Hafi, a rescue worker, said his team was targeted as they were pulling bodies out near Erbin. “As we were pulling out the children and the dead from under the rubble, they targeted us with five rockets – directly targeting us,” said Hafi, 24. At least two civilians were killed in retaliatory rebel mortar fire on government-controlled areas of Damascus, according to state news agency SANA. AFP correspondents said mortars were raining down on Bab Touma tonight. Eastern Ghouta was one of several so-called de-escalation zones agreed last year by three of the main outside players in the conflict – Turkey, Iran and Russia. Ankara announced today it would host a new three-way summit to revive efforts to end the war, which has killed at least 340,000 people and displaced millions since 2011. Recent attempts to bring the conflict’s protagonists and brokers to the table have floundered, but the UN made a fresh call this week for conflicting sides to halt fighting. The United States backed the plea but Russia – a longtime ally of Syria’s government – shrugged it off. “That is not realistic,” Russian Ambassador Vassily Nebenzia told reporters at the UN. A US military official said the US-led coalition that still assists Kurdish-led forces in the hunt for surviving IS members in eastern Syria killed at least 100 pro-regime fighters overnight. The US Central Command said the coalition acted in self-defence after pro-government forces moved on an area under the control of the Kurdish-led Syrian Democratic Forces. The SDF and the coalition targeted the attacking forces with air strikes and shelling after “20 to 30 artillery and tank rounds landed within 500 metres of the SDF headquarters location”, a US official said. Syrian state media confirmed dozens were killed but appeared to deny the forces were army soldiers, describing them as “popular forces”. Wounded fighters were taken to the military hospital in Syria’s eastern Deir Ezzor city, which is controlled by the government. A reporter contributing to AFP saw at least six fighters there, lying on hospital beds in sparsely-equipped rooms. The Observatory said the regime forces may have been aiming to capture of a key oil field and a major gas plant in an SDF-held area. The Omar oil field, one of the biggest in Syria, had a pre-war output of 30,000 barrels per day, while the Conoco gas field had a pre-war capacity of 13 million cubic metres a day. According to the Observatory, the forces that launched the attack on SDF positions were local tribal fighters loyal to Assad and Afghan Shiite militia fighting alongside the regime. In a letter addressed to the UN secretary general, the Syrian foreign ministry said the attack “represents a war crime and a crime against humanity”. It accused the United States of trying to set up permanent bases in Syria under the cover of fighting terrorism. Email “Notorious British IS fighters nicknamed the 'Beatles' captured by Kurdish forces - reports”. Feedback on “Notorious British IS fighters nicknamed the 'Beatles' captured by Kurdish forces - reports”.